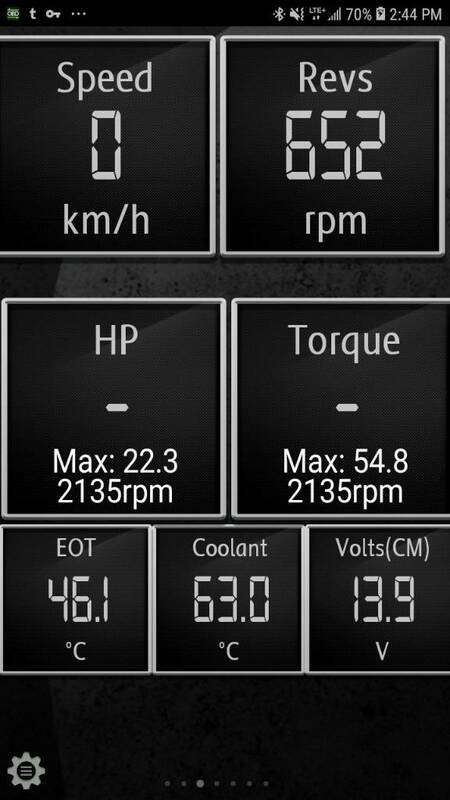 Have you found a good way to display transmission temperature (separate or in addition to engine coolant sensor)? I have a 2014 CX-5 AWD 2.5 GT. I saw the small, what appeared hard-to-read Scan Gauge II that others have reported being able to read transmission and engine coolant temps. I'm hoping to avoid using my phone. Is that the only alternative to the Scan Gauge for reading trans temp? If you found something, what works? This is supposed to display transmission temperature but I suggest you contact them to confirm it will on the 2014 cx-5 before purchasing. Is this engine oil or ATF temp? With the Scan Gauge or what do you use? These look slick. I guess I would need a pod in which to install it. They don't come cheap though, to read ATF temp. I had a ScanGaugeII-X for my '08 CX9 I used to owned. I had to entered a special code for it to display ATF temp. Maybe you can search for what I posted here years ago.... good luck. Someone might have shown me this, or I forgot where I found the link, but this has a hardwired, small display with what seems to be a large, clear readout (but wish there were options for analog). It appears much clearer and more modern looking than ScanGauge II. And from their website, it also appears they have built up support for their product, much like Scan Gauge. Who has had experience with the UltraGauge MX? MX is their model that reads manufacturer's codes in addition to standard OBDII. The MX model at $90 it's not too expensive, has capability for reading codes like trans temp. The website says it can show up to 7 pages of data with 2 to 8 "gauges" per page. That's a lot of information. I'm wondering if anyone with our cars has used this product, how they like it, and how it's held up. They have only a 30 day guarantee, but on Amazon, they are very highly rated. Their few low ratings come from those who didn't purchase a mount which comes from the manufacturer's page not from Amazon. Last edited by 2014CX5GTAWD; 04-20-2019 at 02:30 PM. I am running a Scangauge II set to display water and ATF temp and some other stuff. It is far from hard to read. Thanks ColtX-5. Good to know. I like how thin the Scangauge is. I'm comparing it to the http://ultra-gauge.com/ultragauge/ultragauge_wired.htm the MX version that reads and displays from manufacturer codes. I like the display, the amount of information displayed, and the alarms you can set.